This entry was posted on May 24, 2018 by Logs Direct. If you go down to the woods today, you might be in for a big surprise. Did you know, for example, that landowners are becoming reluctant to plant new woodlands? Often this is because of the damage caused by pests, particularly the non-native grey squirrel. The risks to the long term supply of UK-grown timber, in all its forms, is plain to see, as is the risk to Britain’s woodland landscape. But did you realise that where coordinated woodland management exists, it levels the playing field for our much loved native red squirrels? It helps them hold their own against the ‘grey invasion’. 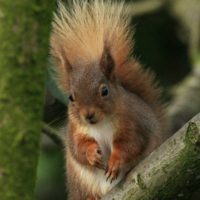 In the beautiful Rusland Valley in the southern Lake District, the local community treasures its red squirrels and is working hard to ensure numbers recover. This is a challenge. Its mixed woodlands are attractive to greys migrating northwards and they directly threaten the heartland of England’s red squirrel territory. Fortunately Logs Direct has recognised this challenge. The company has committed to work with our charity, Westmorland Red Squirrels, by raising money to help meet the costs involved and by spreading the word that active woodland management can make a difference. In adopting this approach to sustainable woodland management Logs Direct is an example to every business in the woodland supply chain. We’re really grateful for their support. Funds raised help us to buy and locate wildlife cameras that confirm the presence of reds (and greys). They help raise awareness among local people and visitors that reports of sightings are important. They help us support land owners in managing their woodlands. That way, we ensure a joined-up approach and avoid havens where greys breed and from which they then spread.